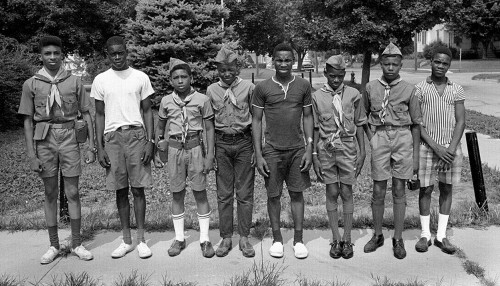 These are the boys from Troop 14 standing in front of May Green School before they head off for a week at Camp Lewallen in July 1966.The scouts raised money by selling soft drinks at the Arena Park stock car races and distributed posters. When they came up short of enough money to send all the boys to camp, the Cape Jaycees made up the difference. My film scanner was taking a lot longer than usual tonight, then I ran into an odd Photoshop output glitch. I will add a Boy Scout picture until we get more from Ken. Speaking of Ken, he was snapped by Frony with other scouts performing a public service. I believe Eddie Slaughter and David Vann are on the left. I think I see Calvin Sides and Larry Ross. As promised, here are even more photos of the boys of Troop 14.